I am not comfortable using those imitation meats available in the markets. Its not about the taste that worries me - but its the ingredients in the packet which raises concern. A lot of artificial ingredients go into these and calories don't look good too. With so many doubts lingering in the mind, its better to be safe than sorry. I like using tofu, soy chunks (for Indians) or TVP - Textured Vegetable Protein, Tempeh, Seitan, Paneer (Indian cottage cheese) and mushrooms as meat substitutes. They work just fine. For most chicken based dishes you can use Paneer - Many non-vegetarians have been cheated with this paneer in my household! Quite a few don't seem to like the taste of tofu, tempeh or seitan - but the cooking process can usually make them taste better. Like for instance - Tofu needs lots of flavors which it needs to absorb. So marinading it for some time always helps to improve its taste. Seitan and Tempeh - broken down into smaller pieces and cooked in a gravy or with other strong seasonings absorb it very well and end up delicious without being bland. I like Seitan and don't find that much of a necessity to douse it with other ingredients. 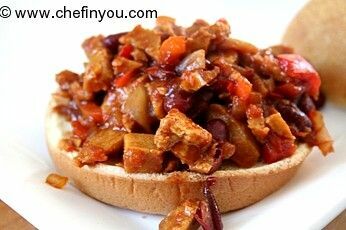 Like in this Sloppy Joe recipe - where I have substituted Seitan for Beef which is usually used in a regular Sloppy Joe (or turkey). The protein level of Seitan is humungous. About 85gms of Seitan consists of 18gms of Protein! 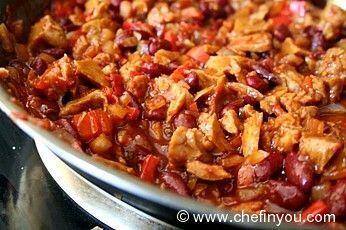 In this dish as if this was not enough, I went ahead and added Kidney beans. So at the end after taking few bites of your sloppy joe, you end up feeling v. full - as if you just had the original with the meat. But the best part is it doesnt make you feel heavy - just full :) But imagine - how much of fat you cut out by omitting the meat. Cutting out the meat once in a while should not be problem. But you can of course go ahead and add lean beef instead of the seitan and make the same recipe. This recipe has been adapted from Ellie Krieger's version which I loved. I just made v few changes to incorporate my needs and also to accommodate for the ingredients I had on hand. Refer to the original version to make a meat based version. Her recipe is equally healthy and simple. 1. In a skillet add 1 tsp vegetable oil. 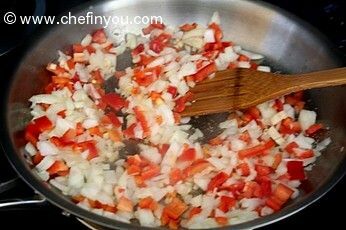 Add the onions, cloves and red bell peppers. Sprinkle some salt to help it soften faster. Saute until soft. 2. Now add the tomato paste. 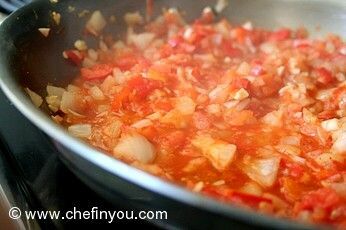 Stir and then add the tomato puree. Cook for 5-6 more minutes for the tomatoes to cook. 3. 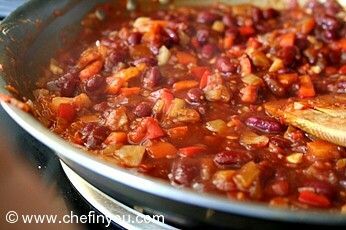 Mix in the kidney beans. Add molasses, ketchup , cayenne pepper and Worcestershire (if using). I like little heat hence add the pepper. Its completely optional. 4. The Seitan I got was pre cooked and needed only warming up. Hence am adding the seitan last. If yours is not the pre cooked variety, add it first along with onions for it to cook along with the rest of the ingredients. 5. Mix them all together and cook for another 5-8 minutes till it comes together. Taste and add salt and pepper if needed. 6. Dry toast the burger buns or grill them on one side. 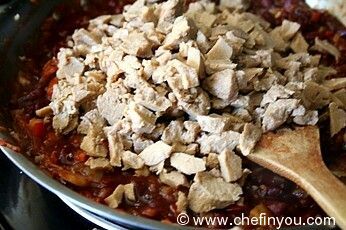 Place one side on the plate cut side up and ladle the seitan-kidney beans mixture on top. Close with the remaining bun and enjoy. With some salad and a drink it makes a complete and filling meal. Rest assured that you are taken care of for almost whole day - the protein keeps you filled for a long time without making you feel heavy or overstuffed. I made this for office pot-luck - added 3 times to all ingredients. First time I made Vegetarian Sloppy using Soy Chunks and turned out very nice and very tasty. Looks mouth watering! 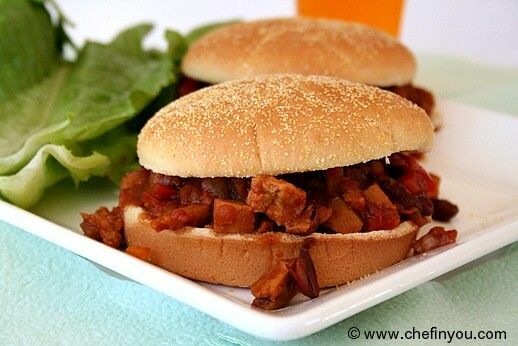 Can you tell us the Indian style Sloppy joe recipe too? Keep going!! Love ur posts! Hey,was looking for a vegan sloppy joe recipe and ended up here...u have a nice space here.Thanks for the recipe. 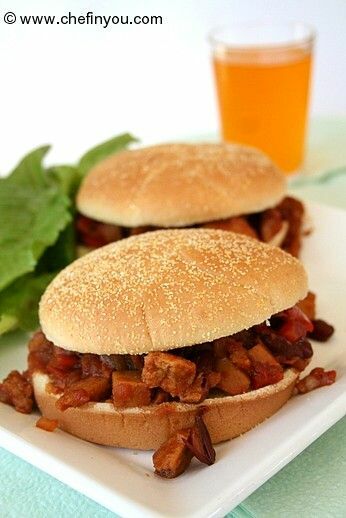 Love the sloppy joes.This was in my to -do list.Nice that you used seitan.I could not get my hands on it or tempeh for that matter.Do blog dishes with tempeh.I have heard its pretty much tasteless when compared to tofu and hence missed buying it. 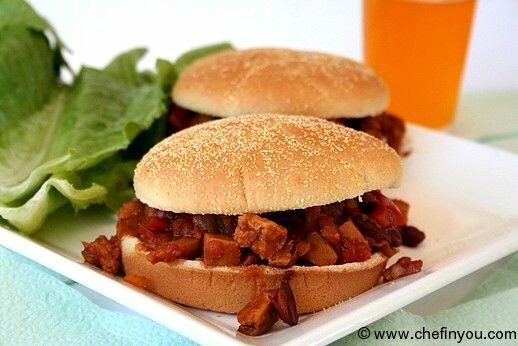 never heard of sloppy joe's or seitan before but that sure looks yummy! Sounds very interesting, fabulous vegan dish DK. I have heard so much about this sloppy jones, never knew there was a veg variety. Looks yumm as always. Sounds like a great substitute for meat that would very well work for me. Those sloppy joes look amazing. I love to try the vegetarian meat alternates just to see how they taste. There are some that are really good and some are just awful. 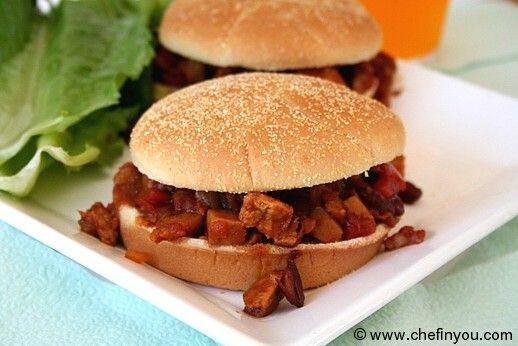 My favorite however, hands down, is seitan and ur recipe looks sooooooo tempting. Will try. This looks good, I'll have to try it. The pictures are great!